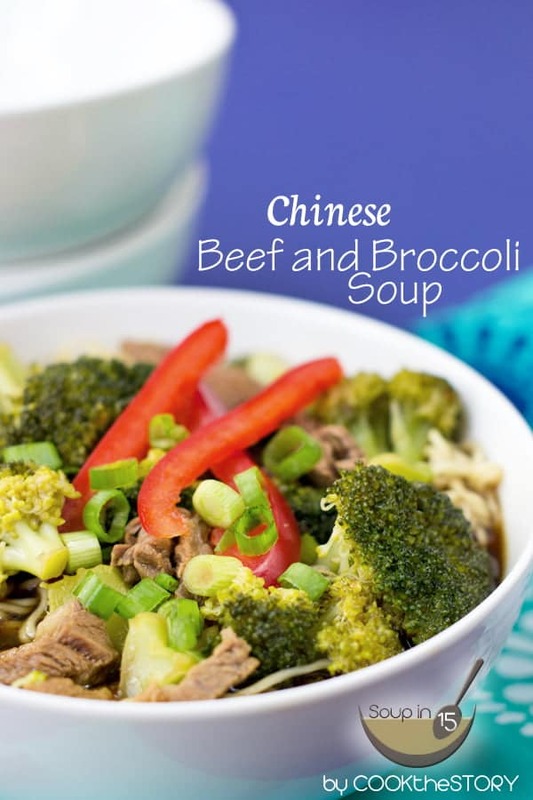 This beef and broccoli soup is hearty, healthy, and delicious. The best thing is that it’s ready, start to finish, in under 15 minutes. Even quicker then take out! Don’t you just love ordering a beef and broccoli stir fry when you’re at a Chinese restaurant? It’s always one of my favorite things. The tender crisp broccoli and the saucy, sweet beef. You can’t go wrong. This soup has all the flavors of the classic Chinese restaurant dish. 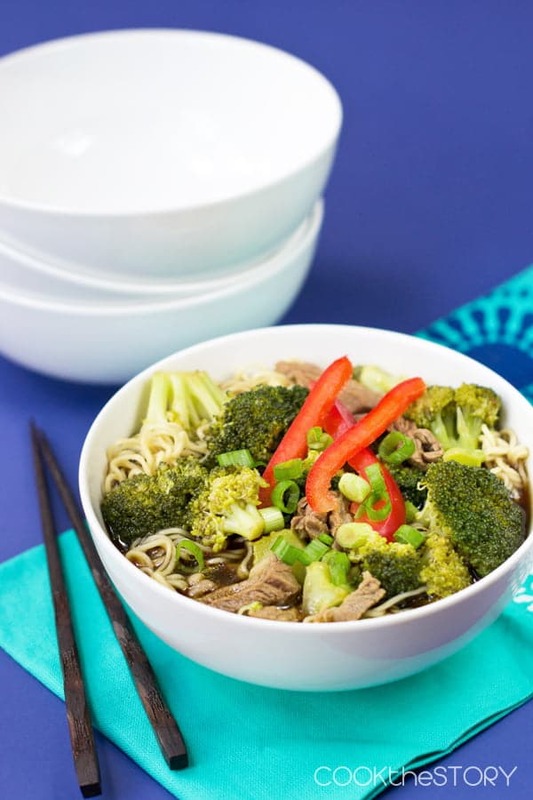 It’s got sweetness and salty soy sauce, ginger, and then the beef and the broccoli of course. I like to do this one with Ramen noodles. I like slurping them up. But you could do rice instead if you wanted. As with all of my SOUPin15 recipes, this one is ready in under 15 minutes. I think that what makes it so delicious is the cold chopped green onions and bell peppers that you add at the end. Cold garnishes on top of a soup are easy to prepare while the soup is simmering and they add that crunch and great flavor when you’re eating. For more tips for making soup is delicious quickly, head over here. If you like this soup, I bet you’d also like this Vietnamese Noodle Soup. It’s made with leftover turkey but you could also use rotisserie chicken or even sliced beef as you do for today’s beef and broccoli soup. 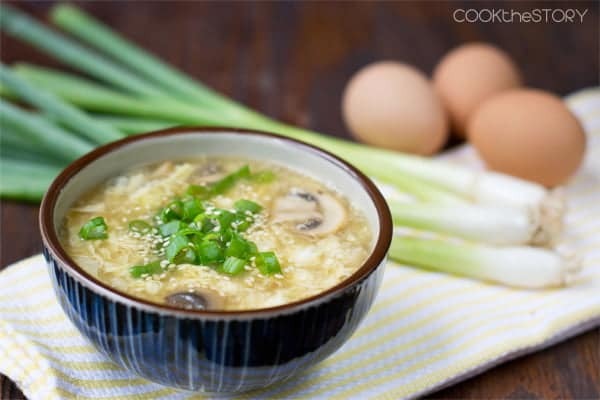 A quick Asian soup that is so much fun to make, and to eat, is this 15 Minute Egg Drop Soup. And now, let’s get back to that beef and broccoli! Fill a medium saucepan with tap water. Cover and bring it to a boil over high heat. When it reaches a boil add 1 teaspoon of the salt and the Chinese noodles. Return to a boil. Reduce heat to low and simmer and cook until tender, 3-5 minutes. Drain noodles and set aside. While the water heats and the noodles cook measure the vegetable oil and sesame oil into a large pot or Dutch oven. Turn the heat to medium-low and add the red pepper flakes and the ginger. Stir. Slice the garlic and add it. Cook for 30 seconds. Add the beef broth. Cover and increase the heat to high until it reaches a boil. 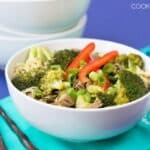 While the broth is heating cut the broccoli into florets, slice the bell pepper and chop the green onions. Slice the steak into 1/4-inch slices. When the broth reaches a simmer add the broccoli. Cover and return it to a boil. 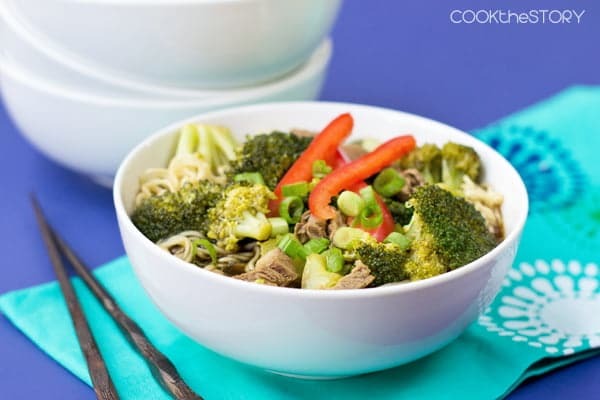 Reduce to a low simmer and cook until broccoli is tender-crisp. Then remove the ginger from the broth. Add the sliced beef. Simmer 2 minutes. To serve divide the noodles among 4-5 soup bowls. Top with the beef soup. Garnish with pepper slices and green onion. What a delicious and healthy soup. Love how easy this is to make.. I have to try it! BEAUTIFUL soup! Great dinner idea! I always love your soups! This looks so good. My whole fam would love it. What an easy and delicious looking soup! Love all of the stuff going on in this soup. And dinner in 15 minutes – I’m so on board! Love it! Soup in 15 minutes, and so delicious!! Just brilliant! Love that you took something we all know and made it into a soup. Love that this one comes together so quickly – perfect for a busy weeknight dinner!